With Thanksgiving just a few days away everyone envisions their favorite part of the annual Thanksgiving meal. My two favorites are pumpkin pie and sweet potatoes. This was not always true. As a child growing up those orange potatoes were scorned. Out of the can, into the oven with marshmallows, or brown sugar and butter all the more to entice us to taste them. Yuck they are orange. Many people relagate sweet potatoes to Thanksgiving and fall dinner. Today after trying them numerous times as I matured I have come to enjoy this root vegetable all year long in a variety of ways. The nutritional benefits of this root vegetable are often touted with the big three being Vit A, Potassium and Vitamin C. It's versatility has made it a healthier alternative as a side dish or vegetarian entree. It can be baked, mashed, made into a casseroles (maybe with meringue), tarts and of course pie. Adding honey, fruits, and just reducing the butter and sugar make the dish healthier for you. So if you are adventuresome try something different this year. Your children may actually like it. For the gardener that want to try growing sweet potatoes here is some information culled from a few resources. Sweet potatoes Ipomoea batatas are defined by wikipedia as A dicotyledonous plant that belongs to the family Convolvulaceae. Its large, starchy, sweet-tasting, tuberous roots are a root vegetable. The young leaves and shoots are sometimes eaten as greens. Why the confusion? In the United States we tend to call all orange fleshy potatoes yams or sweet potatoes.This came about because the two names became interchangeable due to labeling requirements of the FDA. Most yellow or orange skinned potaotoes found today in the supermarket are sweet potoatoes. To find Yams you would need to find and international market. For more historic information Difference between yams and sweet potatoes. How do you grow and store sweet potatoes? Growing sweet potatoes seems to be quite easy according to all of the directions I have found online and in my vegetable gardening books. As a child you may have sprouted sweet potatoes in a glass with toothpicks as a science project. You can still use this method to produce your slips and plant them but need to make sure your potatoes have not been treated for sprouting. Organic potatoes are not treated or you can purchase slips from a nursery or online. If you have a large garden you can plant them in rows with hills, or plant them in a container or the new bags with a trellis. In the garden, on a trellis, or in a container, sweet potatoes are a beautiful plant—delicious tubers in the fall are an added bonus to the lovely foliage and flowers. Sweet potatoes grow well in a sunny vegetable garden, but you can also grow them in other parts of your home landscape. Try them as a temporary groundcover or a trailing houseplant. In a patio planter, a sweet potato vine will form a beautiful foliage plant that you can harvest roots from in fall. Sweet potatoes will grow in poor soil, but roots may be deformed in heavy clay or long and stringy in sandy soil. To create the perfect environment, build long, wide, 10-inch-high ridges spaced 3 1/2 feet apart. (A 10-foot row will produce 8 to 10 pounds of potatoes.) Work in plenty of compost, avoiding nitrogen-rich fertilizers that produce lush vines and stunted tubes. In the North, cover the raised rows with black plastic to keep the soil warm and promote strong growth. It's best to plant root sprouts, called slips, which are available from nurseries and mail-order suppliers. Or you can grow your own, by saving a few roots from your previous crop or by buying untreated roots (store-bought sweet potatoes are often waxed to prevent sprouting). About six weeks before it's time to plant sweet potatoes outdoors in your area, place the roots in a box of moist sand, sawdust, or chopped leaves in a warm spot (75º to 80ºF). Shoots will sprout, and when they reach 6 to 9 inches long, cut them off the root. Remove and dispose of the bottom inch from each slip, as that portion sometimes harbors disease organisms. Sweet potatoes mature in 90 to 170 days and are extremely frost sensitive. Plant in full sun 3 to 4 weeks after the last frost when the soil has warmed. Make holes 6 inches deep and 12 inches apart. Bury slips up to the top leaves, press the soil down gently but firmly, and water well. If you're not using black plastic, mulch the vines 2 weeks after planting to smother weeds, conserve moisture, and keep the soil loose for root development. Occasionally lift longer vines to keep them from rooting at the joints, or they will put their energy into forming many undersized tubers at each rooted area rather than ripening the main crop at the base of the plant. Otherwise, handle plants as little as possible to prevent wounds that might be invaded by disease spores. If the weather is dry, provide 1 inch of water a week until 2 weeks before harvesting, then let the soil dry out a bit. Don't overwater, or the plants—which can withstand dry spells better than rainy ones—may rot. You can harvest as soon as leaves start to yellow, but the longer a crop is left in the ground, the higher the yield and vitamin content. Once frost blackens the vines, however, tubers can quickly rot. Use a spading fork to dig tubers on a sunny day when the soil is dry. 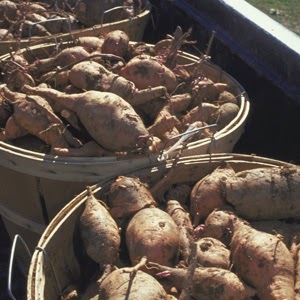 Remember that tubers can grow a foot or more from the plant, and that any nicks on their tender skins will encourage spoilage. Dry tubers in the sun for several hours, then move them to a well-ventilated spot and keep at 85° to 90°F for 10 to 15 days. After they are cured, store at around 55ºF, with a humidity of 75 to 80 percent. Properly cured and stored sweet potatoes will keep for several months.